At what age is cleft surgery performed? What is the cost of cleft surgery? Nearly all cases of cleft lip and cleft palate are diagnosed before birth (via ultrasound), or at birth because the defect is clearly recognizable. Children who have a cleft lip, with or without cleft palate, may have ongoing feeding and speech problems, along with frequent ear infections and a higher risk of hearing and dental problems. Cleft lip and cleft palate — also known as orofacial clefts — are the result of birth defects where the mouth and lip structures have failed to form properly during the first trimester of pregnancy. According to the Center for Disease Control and Prevention, 2,650 American babies are born with cleft palate each year, and 4,440 are born with cleft lip, which amounts to approximately one in every 500 children. Nearly all cases are diagnosed before birth (via ultrasound), or at birth because the defect is clearly recognizable. There are rare cases when a baby could have a cleft palate involving his/her soft palate in the back of his/her throat. This is usually tough to diagnose during an initial exam. If your baby has difficulty latching onto a breast or baby bottle during feeding, this can be a sign of a problem and should be reported to your physician. The cause of this common condition are largely unknown, but it is thought to be a combination of genes and other factors that influence development. These factors include environmental chemicals, food, alcohol exposure, medications, folic acid deficiency, and infections. Known risk factors also include smoking during pregnancy, obesity, diabetes, epilepsy, and medications (topiramate, phenytoin and valproic acid) taken during the first trimester. A diagnosis for orofacial clefts can take place during pregnancy via ultrasound, or once the baby is born. To treat cleft lip or cleft palate, plastic surgeons undergo specialized training in children’s craniofacial surgery. To learn more this procedure we spoke with North Texas plastic surgeon Dr. Sacha Obaid, and New Jersey plastic and reconstructive surgeon Dr. Francesco Gargano. Cleft lip and cleft palate combined are twice as common than either on its own. A cleft lip deformity is when there is an opening or gap in the upper lip. The gap can be unilateral (one side) or bilateral (both sides). For instance, if it’s a unilateral cleft lip, the gap would extend from the lip under one side of the nose (left or right), and may extend into the nostril. The palate is the roof of the mouth. With cleft palate there is an opening between the roof of the mouth and the nose. This can be part way through the palate, or in some cases it may be the entire palate that has failed to fuse properly. The image below demonstrates these different types of defects. F) Bilateral cleft lip and palate. In either case, these orofacial defects can be corrected through reconstructive surgery. “Cleft lip surgery is performed between 3 and 6 months of age, while cleft palate surgery is done preferably between 12 and 15 months,” says Dr. Gargano. The goal of surgical procedures is to address the many aspects affected by the deformity — appearance, speech, breathing, feeding, and hearing. “Cleft lip surgery is performed between 3 and 6 months of age and involves closure of the lip defect and the alveolar defect. At the time of cleft lip repair a primary rhinoplasty of the tip of the nose is required through minimal incisions. The surgery will allow the patient to have a better feeding and also to guide the growth of the maxilla (jawbone). Repositioning of the upper lip and nose is also achieved with this surgery,” informs Dr. Gargano. “Palate surgery is done preferably between 12 and 15 months of age. 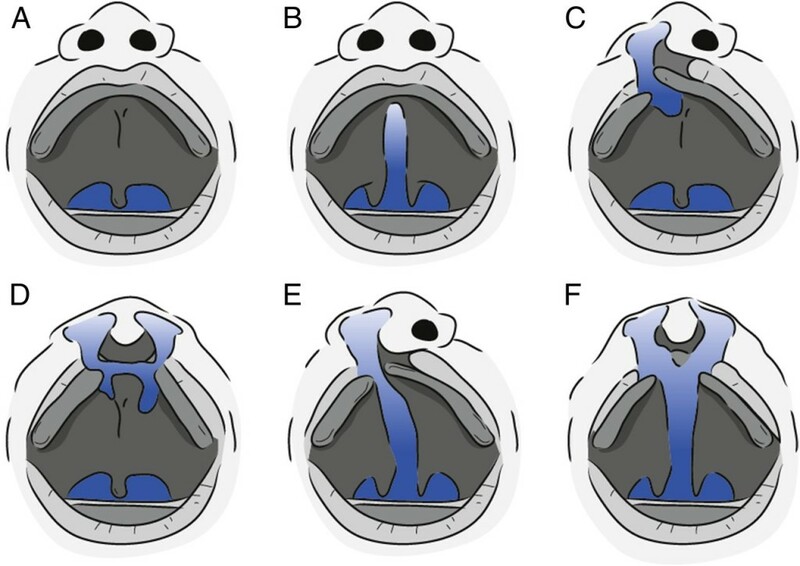 As already suggested, the timing of the palate surgery is very important for speech development. The palate surgery involves closure of the nasal and palatal mucosa and repositioning of the levator muscle in its proper anatomical position,” says Dr. Gargano. Both surgeries are performed under general anesthesia. In general, the wounds are completely healed in around 6 weeks. And in terms of scars, cleft lip surgery will leave a small scar between the upper lip and the nose. Velopharyngeal dysfunction occurs in approximately 30 percent of patients, when parts of the throat or the roof of the mouth do not function correctly during speech. Essentially, the palate fails to rise to touch the back of the throat as it does in normal speech, causing air to escape through the nose. This inhibits speech, making the child difficult to understand in many cases. When this dysfunction occurs, patients will require either non surgical interventions such as speech therapy or prosthetic devices. Secondary surgery to re-repair and reposition the soft palate may also be required. If you do not have health insurance, you should expect to pay around $8,000 for either cleft lip or cleft palate surgery. If your child requires both cleft lip and cleft palate surgery the cost is typically around $12,000. Therefore, over the course of their lifetime it is not uncommon for a child to consult with a group of health professionals including medical, surgical, dental, and allied health disciplines. “Although improvement of speech and feeding is expected immediately after the surgery, the addition of speech therapy will help the child with speech development and acquired sounds,” says Dr. Gargano. Some children who have had their cleft palate repaired will not achieve complete closure for 3-4 months following surgery. However, research suggests that by the ages of 14 to 18 months, speech differences in achieving stops and vowels between typically developing children and those who have had cleft palate repair and infrequent. Parents should also expect that their children may require additional surgeries at a later stage. Dr. Gargano advises that rhinoplasty (a nose repair or reconstruction) may be necessary in some cases. It is also likely that children will undergo orthodontic treatment. On top of this, when the growth of the maxilla is complete, they will be evaluated for orthognathic surgery, which can correct any conditions of the jaw and face that can’t be treated with braces. “The good news is that most babies with a cleft lip or palate are otherwise in perfect health,” says Dr. Obaid. And despite some possible setbacks, most children with this condition live normal happy lives after surgery.